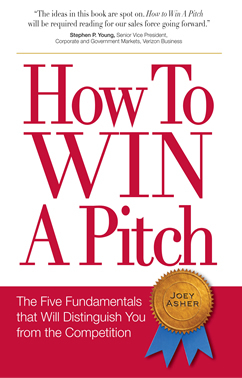 How to Win a Pitch: The Five Fundamentals that Will Distinguish You from the Competition is the definitive book on how to create and deliver sales presentations that win business. The book details the strategies and tactics that have helped Speechworks’ clients deliver presentations that have won billions of dollars in new business contracts. Focus the message on the business problem. Organize the message around three memorable points. Involve the audience in the presentation. The author is Joey Asher, President of Speechworks, a nationally known coach, who has worked with sales teams across all industries in helping them create and deliver winning sales presentations. The book covers everything you need to create winning business presentations. If you want to deliver great sales presentations, read How to Win a Pitch.